I used to keep a bottle of “Quiet Lotion” on my therapy table. The idea came from Dr. Jean at www.drjean.org. All I did was glue a label on a bottle of hand lotion. If the students needed a bit of calming down, I offered them some “Quiet Lotion” and told them that “Quiet Lotion” worked like magic to help them calm and quiet themselves and get ready to learn. Ah, the power of suggestion and a label. If you haven’t visited www.teachertipster.com yet, please do. 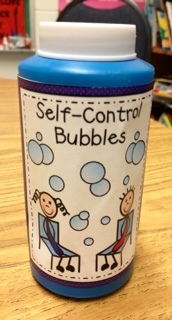 One of the great ideas there is using “Self-Control Bubbles”. A Bubble Poppin’ Behavior video shows how to introduce the idea of self-control. 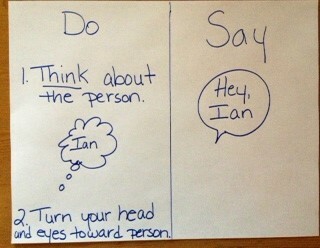 My plan is to introduce this concept to my kindergarten social skills group. There are so many ways that they can apply it!! Once they are aware of how they CAN use self-control, we can refer to that time as a reminder . I showed this to my favorite kindergarten teacher today and she said this would make a great whole class lesson. I agree. Our thinking caps are working overtime this week! 2nd grade groups are hard at work on making inferences. Making inferences from what we read, what we see, and from what others say can be difficult. Inference is about drawing conclusions based on evidence and prior knowledge. 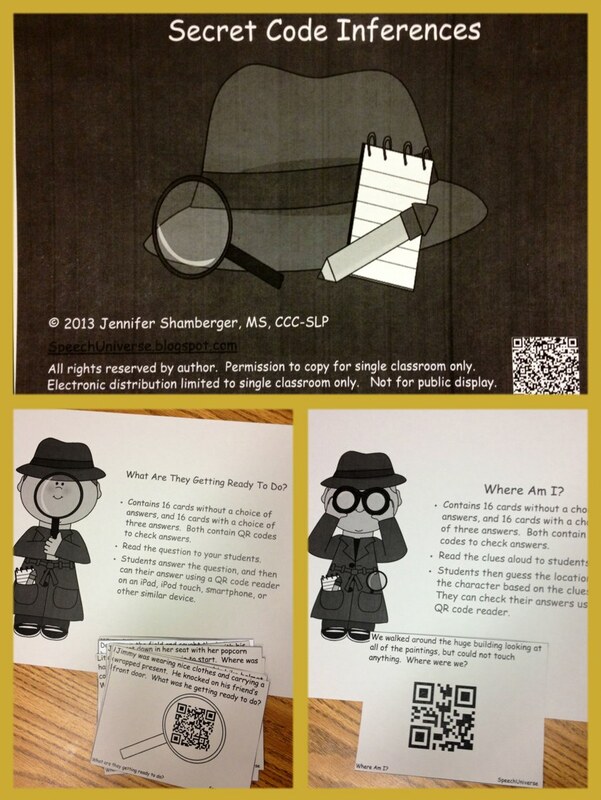 Jennifer Shamberger over at http://speechuniverse.blogspot.com created this fantastic activity called Secret Code Inferences-with QR code answers. Included in this download are activities targeting 5 areas of inferencing. 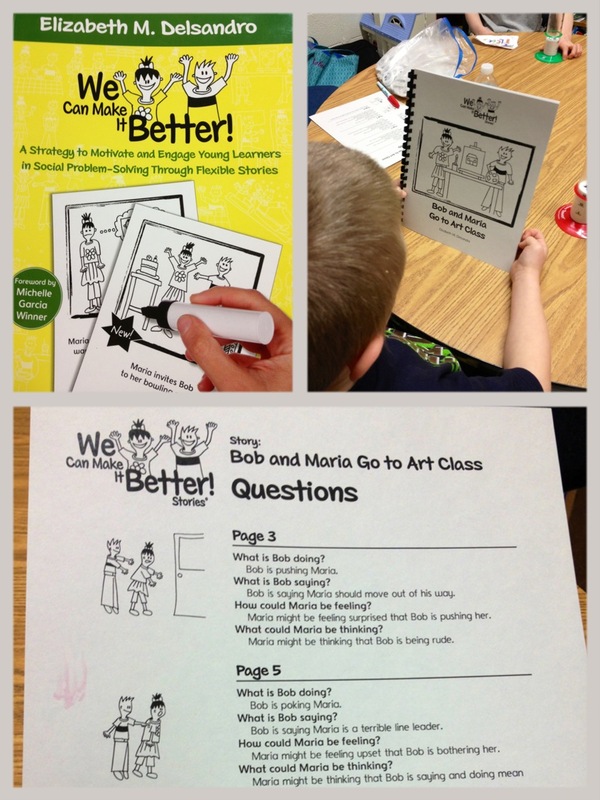 Each activity looks at answering questions using clues. Questions are- What are they getting ready to do? What happened? Where am I? Who am I? and What am I? The coolest part of this activity is that students can check their answers using a QR code reader on an iPad, iTouch, or iPhone. The QR reader app is free. 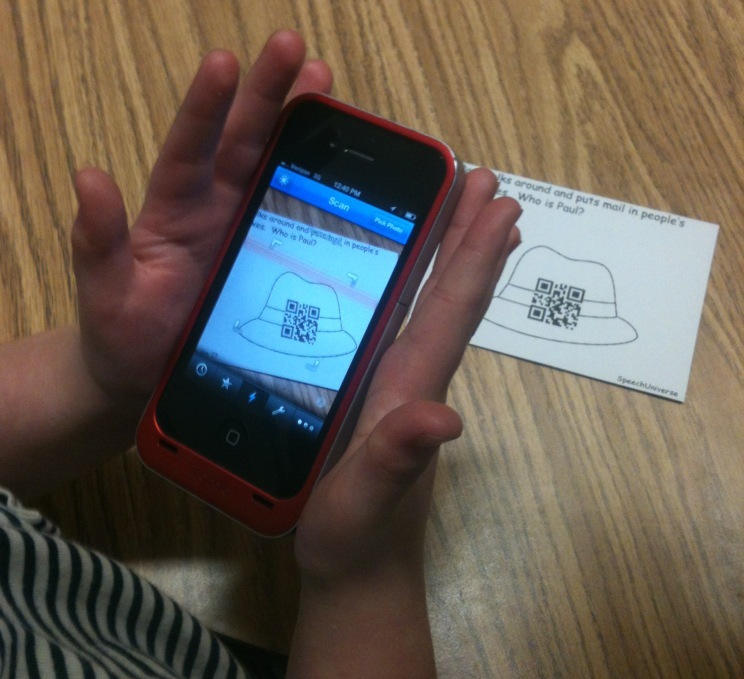 The lunch buddies LOVE using my iPhone to scan the code on each question card to check their answer. I think the QR code reader is as exciting and fun as the students!! Children who have a number of alternative cognitive problem solving skills to draw from can be more flexible in choosing solutions to social conflicts, are less likely to act impulsively, and more likely to act appropriately in social situations. Some examples of cognitive problem solving skills are: the ability to generate more than one alternative solution to a conflict; the ability to choose and implement an appropriate solution to a conflict; and the understanding and consideration of the social consequences of one’s acti0ns for oneself and others. 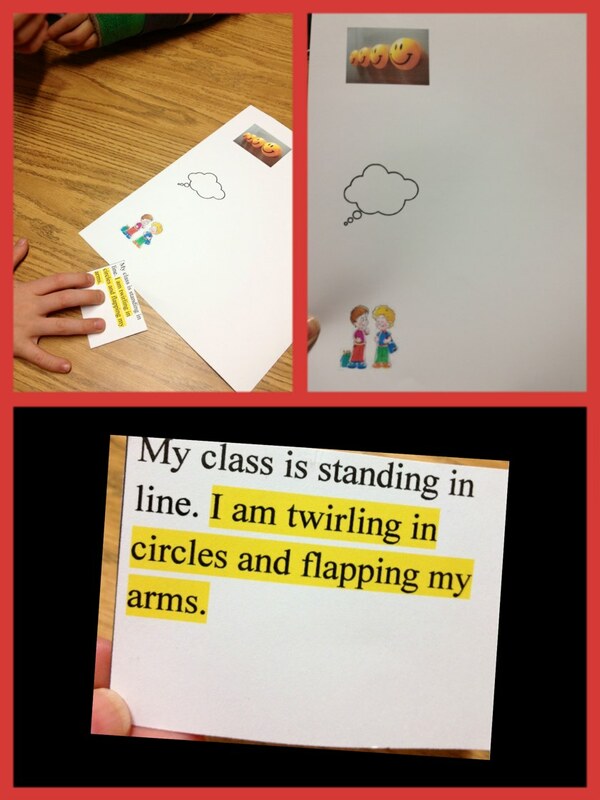 We tried out one of the flexible stories Friday in the 1st grade group. I bound the pages of the story to look like a book. 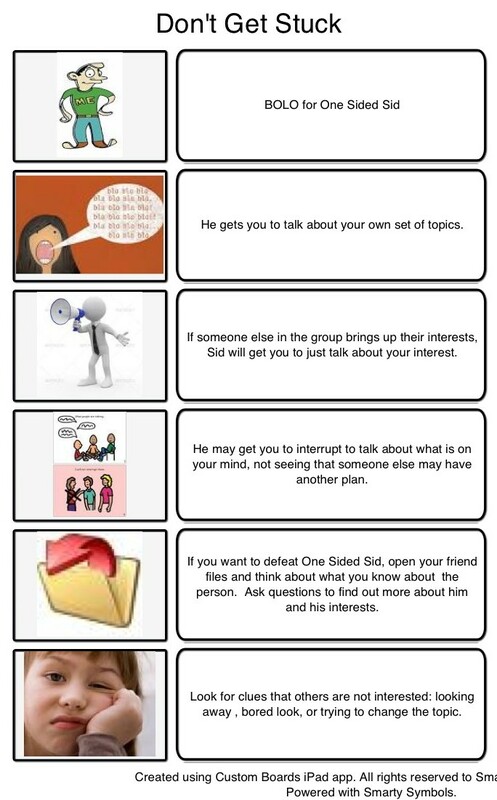 The short story provides an opportunity for the small group to ” identify a social dilemma, express ideas to make the dilemmas better, and gain more understanding in how one person’s behavior (spoken words or actions) can positively or negatively impact the outcome (relationship) between people”. I really like this visual called the “Hello Board”. 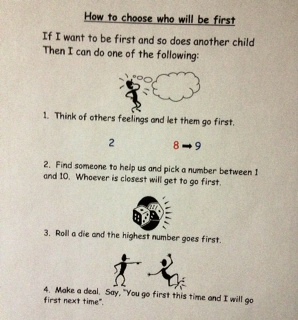 It visually prompts students to think about another person. Most of our students do not need this level of support for greetings, but they do need visual prompts for thinking about another person. Many of our students struggle to determine what others may be thinking or feeling about them. This is another great visual called the “Thinking and Feeling Board” to encourage students to consider the thoughts and feelings of the story characters. Templates are included with the book, but I made my own on the dry erase board. The students are given the opportunity to “repair” the social sceanario. As alternative ideas are generated, an adult writes it down on a sticky note. Then the group can decide how to “make it better” and create a new story. This activity was new to the Friday 1st grade group. They were expecting a more “game like” activity so their reaction was not as positive as I had hoped : ) We will try it again. I will be better prepared and work on making it more fun. I want to share what Michelle Garcia Winner wrote in the Foreword of We Can Make It Better!. 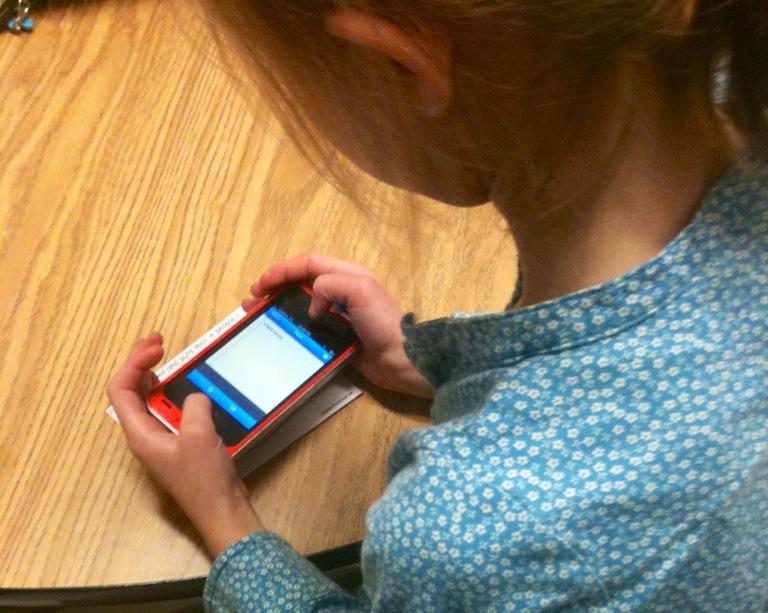 “Those born with social learning weaknesses often stand out as less successful in class and at play, given their inability to figure out much of what comes readily to most of their peers. These students often are misunderstood and simply labeled as behavior problems, given the frequent disparity between how well they’re able to learn on their own and how unable they are in a group. Scratch below the surface, however, and you frequently find a student who simply does not understand the social demands and emotional complexities that most of their peers comprehended by early elementary school”. 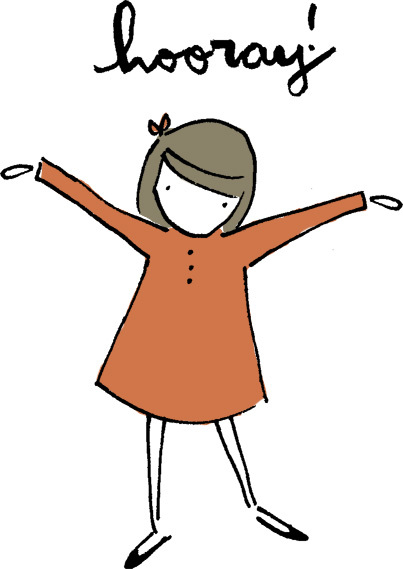 I was doing my happy dance today! 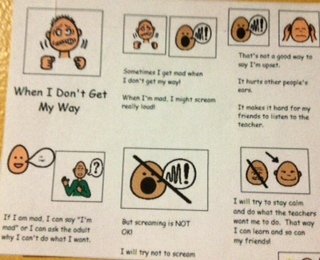 Yesterday’s blog covered the visual and coaching experience for what to say instead of “I don’t know” that we covered in the 2nd grade group. 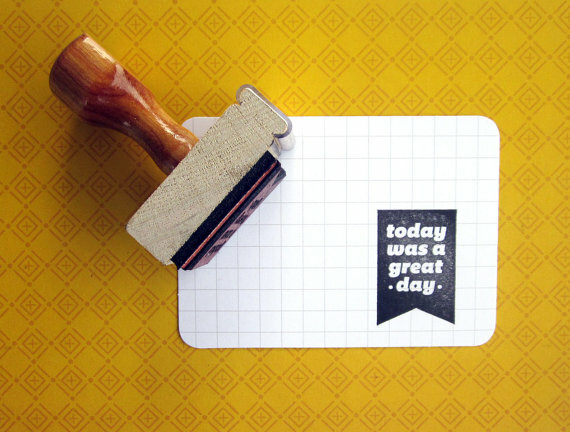 Well… just one day later, guess what? When asked a very difficult question, instead of saying “I don’t know”, a certain lunch buddie said “May I have some more time to think about it?”. Hooray for Braxton! Thank you, Miss Heather for reporting this progress to me. It is very good news when we hear that our work is carried over into the classroom! If someone asks a question while we are reading, thinking, or eating and we don’t want to stop and answer we sometimes say “I don’t know.” If we know the answer and just can’t think of it quickly, we might say “I don’t know”. We say “I don’t know” when we just need to think a minute. We say “I don’t know” when we just want to be left alone. 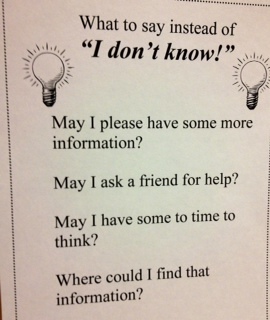 We used this today in our 2nd grade group because it is too easy for some of us to just say “I don’t know” when we don’t want to engage with others. If the question is hard we say “I don’t know” instead of thinking about it. We thought of one to add to this visual May I hear the question again?. 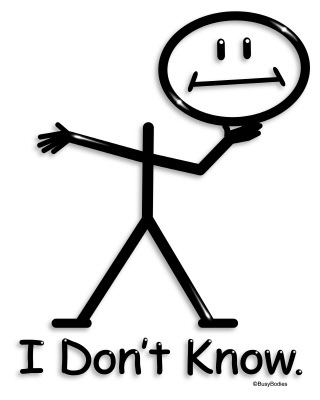 I think having this visual handy will help us learn to say what we really mean instead of “I don’t know”. Jenga has been a versatile game in speech/language therapy for years. I have a Tumble Tower for /r/ words that the students love. 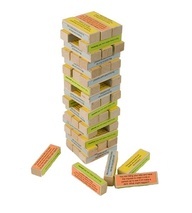 I just discovered a new game for social skills called 4 in 1 Jenga from Castle-Well Therapeutic Play (www.castlewellgames.com). 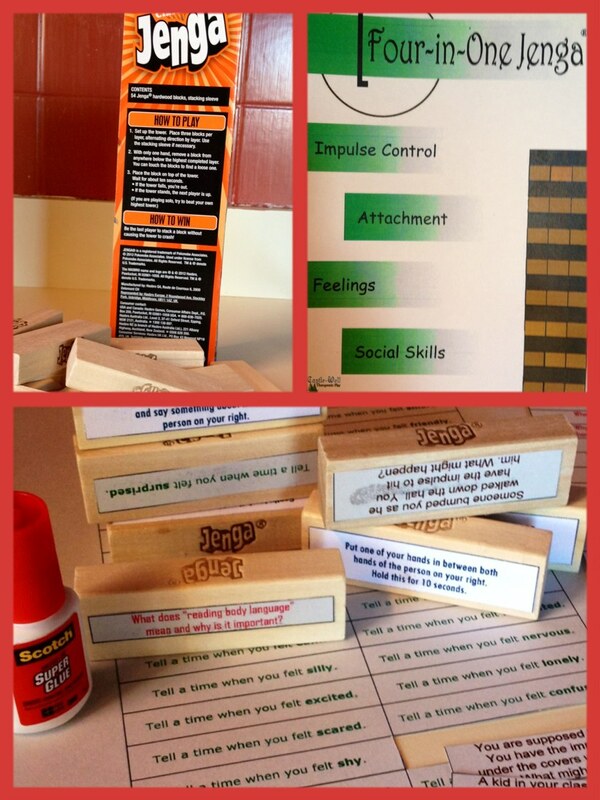 4 in 1 Jenga has attachment, impulse control, social skills, and feelings labels for the four sides of the Jenga blocks. 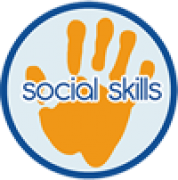 Skills addressed are: improving fine motor skills, increasing observation and problem-solving skills, developing verbal and nonverbal attachment behaviors, improving reflectivity, identifying prosocial behaviors and enhancing emotional competence. 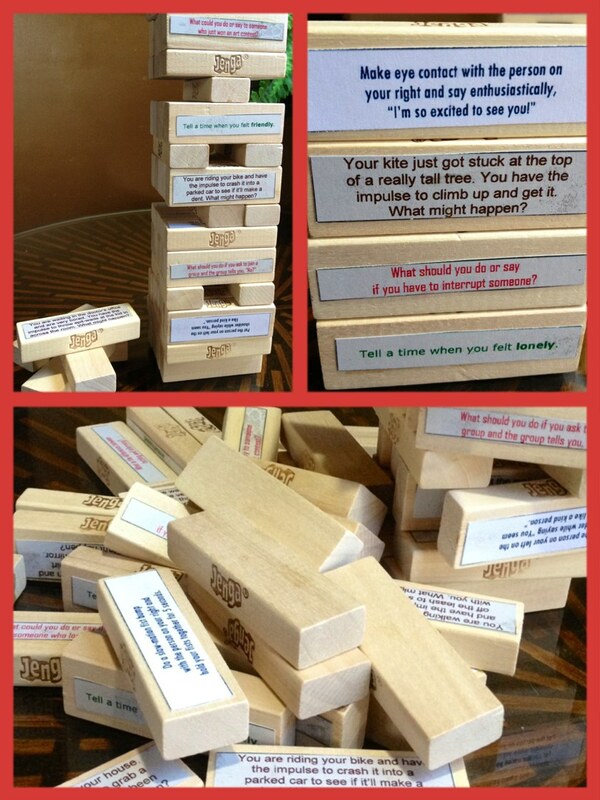 Social skills Jenga uses strengths-based and congnitive-behavioral questions to help children 1) identify times when they have engaged in specific prosocial behaviors, 2) describe various complex prosocial behaviors and 3) identify the fine lines between appropriate and inappropriate behaviors. I purchased the labels as a download for $9.99. I bought a Jenga game and did lots of cutting and gluing. It was time consuming to cut and glue but I think it was worth the time and money. This is how it turned out. We played it today in the 4th grade Lunch Buddies to rave reviews. 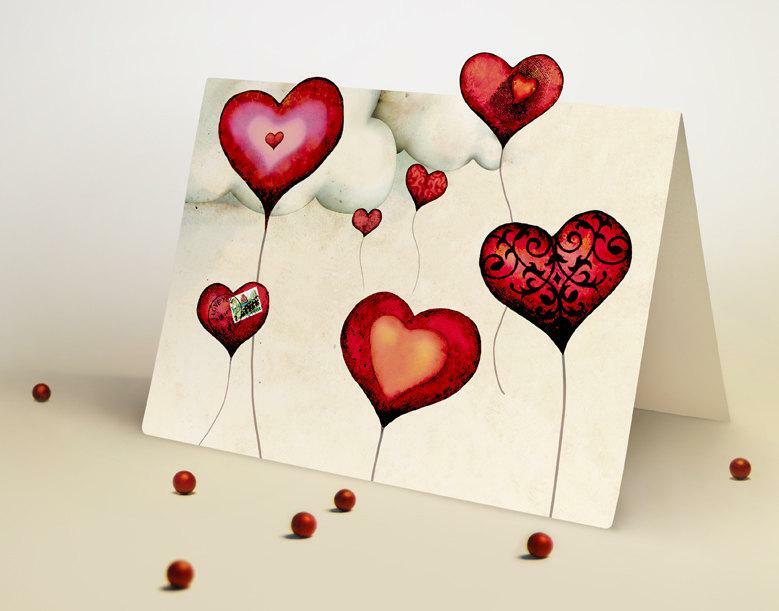 Thinking about you, thinking about me, and thinking about you thinking about me is our mantra. When we really, really want something, want to do something or want things to go our way but it doesn’t work out, strong feelings can make us say words or do things that make others feel uncomfortable. When we make others feel uncomfortable they may think bad thoughts about us like, “she is acting weird” or “those were hurtful words”. If others think bad thoughts about us they may say things like, “I don’t want to play with you”. We always want to keep others thinking good thoughts and feeling good about us. 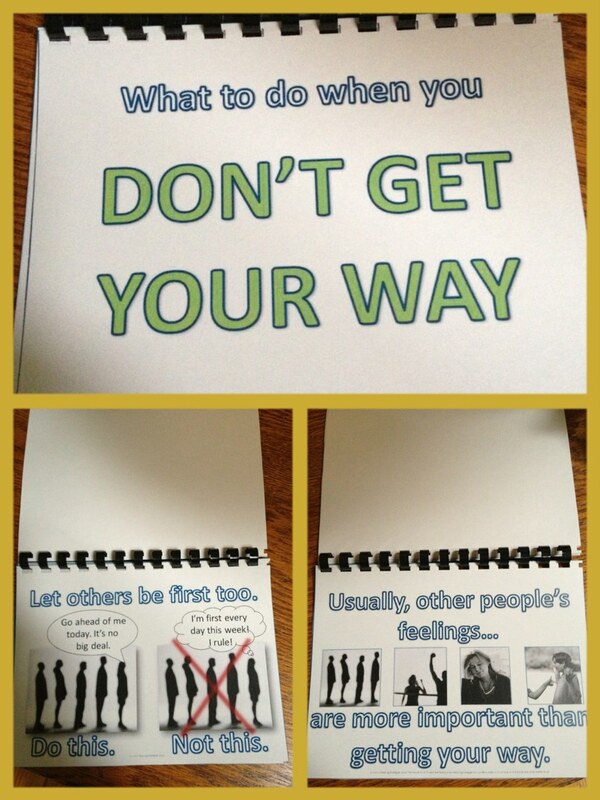 Here is a little book I made using visuals from http://autismteachingstrategies.com . These pictures show the cover and the first and last page. We used it in the Friday 1st grade group. There is also a simple social story at www.BoardMakerShare.com called When you don’t get your way. There is always a way to feel better, calmer, happier about not getting your way. Others like to get their way sometimes. Friends like to win too. Enjoy the Presidents Day Holiday everyone! In lunch buddies we are always talking about how important it is to think of others. We create friend files or brain files so that we can store information about our friends. Those files can help us when we want to have a conversation or when it is time to do something nice for someone else. 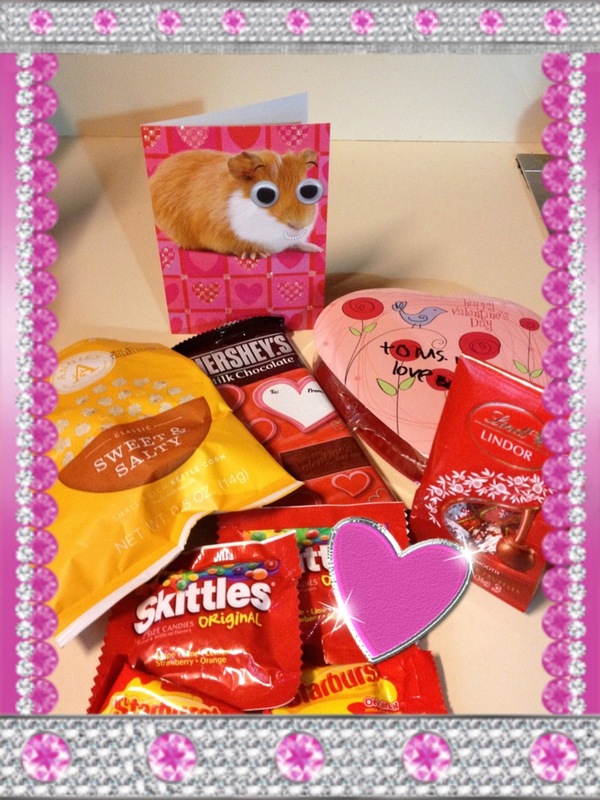 On Valentine’s Day some lunch buddies opened up their brain file on ME. They did something so “sweet” to put a really big smile on my face and a wonderful feeling in my heart. Look at all this sweetness!! Thank you sweet lunch buddies for thinking of me! Every day there are at least two, sometimes three, lunch buddies groups meeting. Today, in theWednesday 2nd grade group, we covered a great deal. Wearing our “ME” buttons (ready to turn them off when necessary) we introduced One Sided Sid as a topic of conversation. He gets people to talk about their interests and favorite topics not thinking of others and their interests. Our mantra is “Thinking about me, thinking about you, thinking about you thinking about me”. If we are only thinking about ourselves we find it very hard to think about what others might be thinking. We seem to be stuck in this spot. Mrs. Rairden created these visuals to see if some of the lunch buddies might be able to get the concept of perspective taking when it is presented in a variety of ways. Each student picked a card with a scenario written on it, such as the one pictured here. Then, the student was asked to state what others might be feeling about your behavior. Next, the student was asked to state what others might be thinking about your behavior. Finally, the student was asked to state what others might say about your behavior. It is a very hard concept for some lunch buddies, but we want to do our best to “get it” so that we keep others feeling, thinking, and saying nice things about us. 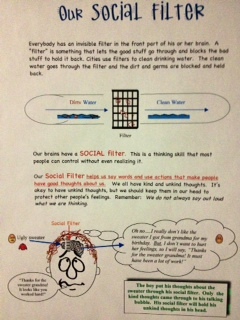 For the 4th grade lunch buddies group, it was time to delve into the “Social Filter”. 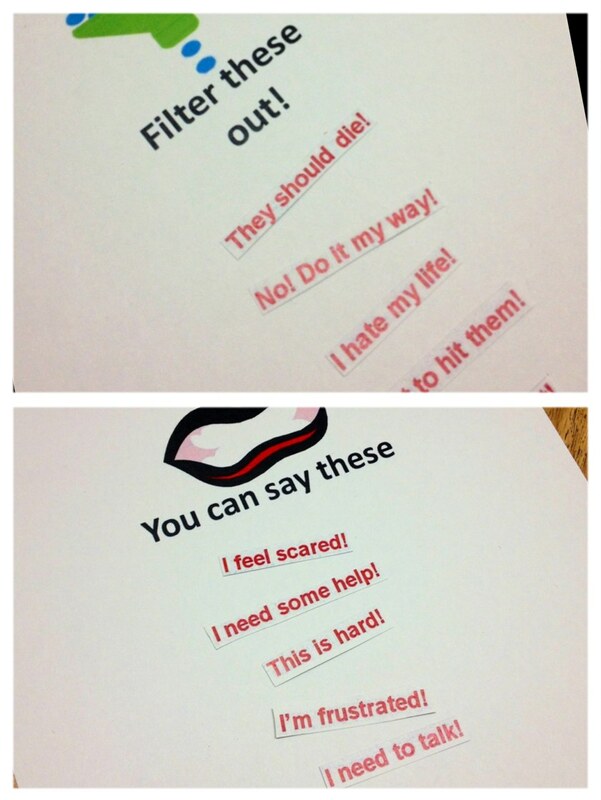 We talked about different kinds of filters. There are coffee filters and water filters. Mr. Smith told us about air and oil filters in cars (he knows a lot about cars). Our brains have filters to help us hold back the angry, hurtful words that we want to say so that we can protect friend’s feelings, save ourselves from being embarassed, show respect, and stay out of trouble. Most people can control their social filter without even thinking about it but some of us need lots of coaching experiences to keep our social filter on. 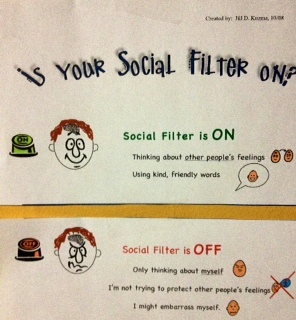 This “Social Filter” game is available as a free download at http://autismteachingstrategies.com (I can always find just the right visuals to support my students there). 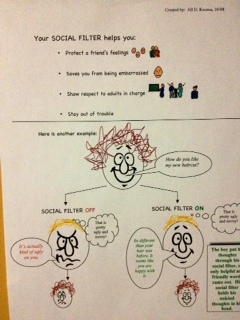 Another fantastic visual created by Jill Kuzma at http://jillkuzma.wordpress.com is a fun way to “show” students what a social filter looks like and cue “is your social filter on” or “is your social filter off”. I must say that the Tuesday 1st grade group had the best day ever!! Walker C. and Austin, we are sooooo proud of you. Everyone in the group was able to defeat Glassman, Brain Eater, and Rock Brain. How did we do it? 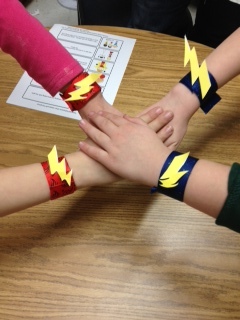 The slap bracelets are a visual reminder to use our super powers! One for all and all for one! 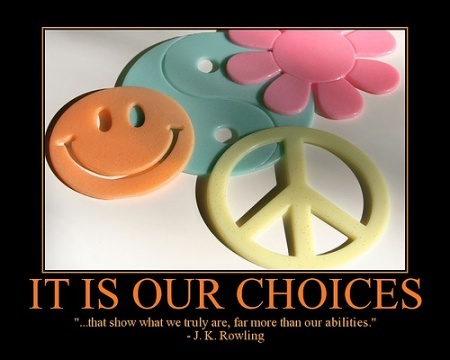 Today was proof that we can make choices that keep others thinking good thoughts about us. I thought I would post a bit of the plus in lunchbuddiesplus. 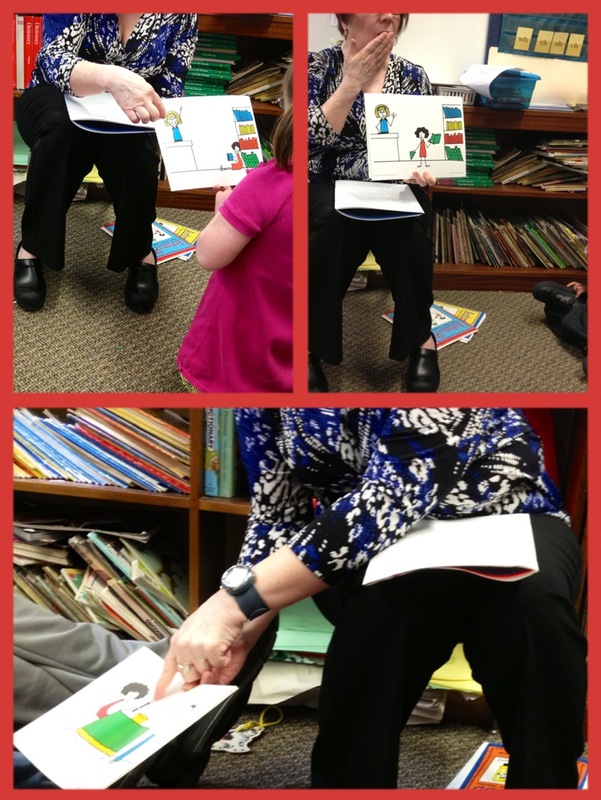 Tuesday afternoons I get to visit a multi-categorical class for a circletime language activity. Lovable Matt and Molly teach communication skills with familiar characters, predictable routines, and fun antics. 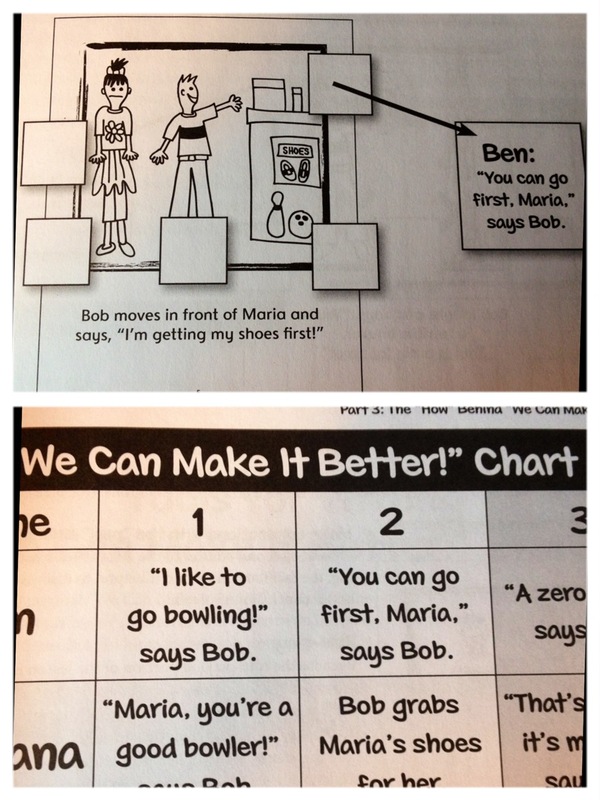 Skills addressed are vocabulary, sequencing, answering questions, predicting, and identifying feelings. Go to www.linguisystems.com and check them out. I also do some articulation therapy. 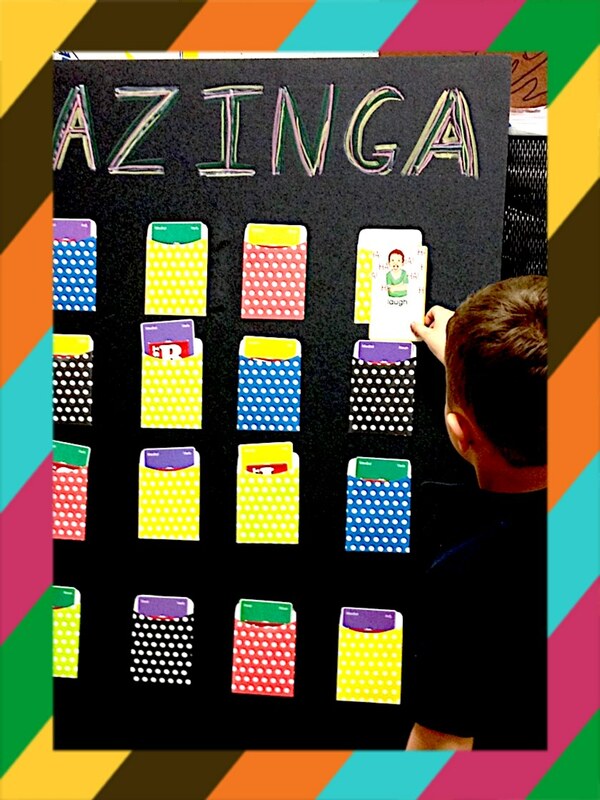 The idea for the Bazinga! board came from http://speechroomnews.com Pictures of targeted speech sounds are placed in the envelopes. I add an extra Bazinga! card into 1 or 2 of the envelopes and whoever gets that card gets a sticker. Yes, today was a good day!